Pizza. (2013). In A.F. Smith, Food and drink in American history: a "full course" encyclopedia. [Online]. Santa Barbara: ABC-CLIO. Available from: https://search.credoreference.com/content/topic/pizza [Accessed 25 April 2019]. "Pizza." Food and Drink in American History: A "Full Course" Encyclopedia, Andrew F. Smith, ABC-CLIO, 1st edition, 2013. Credo Reference, https://search.credoreference.com/content/topic/pizza. Accessed 25 Apr. 2019. Leavened and flattened breads with various toppings have been common in the Mediterranean region for hundreds if not thousands of years. Pizza, which can be traced to 19th-century Naples, Italy, had a variety of toppings, including tomato sauce and cheese. Pizza migrated to the United States late in the 19th century. 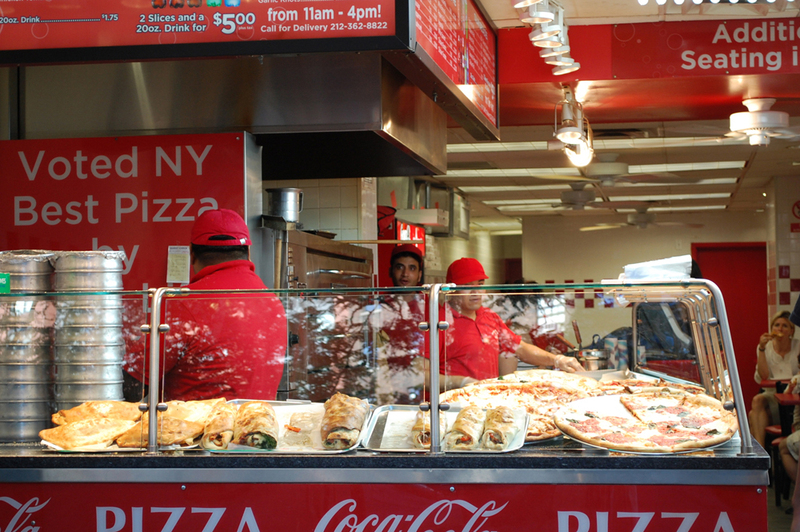 The first known pizzeria in the United States was established by Italian bakers in New York around 1902. By the 1920s, pizza was a common food served in small outlets and at Italian festivals. Pizza became an American mainstream food after World War II. Pizza meshed well with casual dining, could easily be eaten in automobiles or around the television in the home, and was not negatively affected by delays between cooking and eating, which made it ideal for drive-ins and take-home places. The day's supply of pizza dough was rolled out in the morning and refrigerated in 10-inch pans, ready to be quickly topped and baked in the same pan when ordered. This drastically reduced labor costs and made the mealtime rush more manageable. This new method was a boon for franchised chains. Pizza was distinctly different from other fast foods. Before the 1950s, pizza was considered a foreign food. A 1953 song sung by Dean Martin with the lyrics “When the moon hits your eye like a big pizza pie” helped popularize pizza. The first pizza franchises started in 1954 with the creation of the Shakey's Pizza chain, which grew to more than 100 outlets by 1960. Most of Shakey's pizza was eaten in the restaurant. Pizza Hut was the first true fast-food pizza chain. Tom Monaghan made it into the Fortune 500 with his Domino's Pizza, founded in 1960. Frozen pizza was introduced in the early 1960s. There are two claims to having been the first to sell commercially frozen pizza in 1962: Tombstone Pizza in Medford, Wisconsin, and Rose Totino of Totino's Italian Kitchen in Minneapolis. There are many other makers of pizza, such as Red Baron Pizza, founded in 1979; Godfather's Pizza, founded in 1973 in Omaha, Nebraska; and Papa John's, founded in 1984 in Jeffersonville, Indiana. Today, Papa John's has almost 3,000 outlets in 49 states and 20 countries. There are thousands of local and regional pizza parlors. In 2011 Papa John's introduced a six-cheese double-bacon pizza as a promotional item. Helstosky, Carol. Pizza: A Global History. Reaktion London, 2008. Jakle, John A.; Keith A. Sculle. Fast Food: Roadside Restaurants in the Automobile Age. Johns Hopkins University Press Baltimore, 1999. Levine, Ed. Pizza: A Slice of Heaven; The Ultimate Pizza Guide and Companion. Universe Publishing New York, 2005.